The original St Mark’s church is said to have resulted from a walk from Stoke to Newcastle taken by Sir Lovelace Stamer, the rector of Stoke, who noticed the number of houses being erected in the district. He subsequently spoke to the Rev. J. Westbury, the vicar of Hartshill and plans to establish a church in Basford were set afoot. It was designed by Charles Lynam. A prolific architect, he became surveyor to the borough of Stoke-upon-Trent when it was incorporated in 1874. 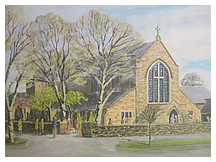 On Apr 27th, 1878, St. Mark’s was opened in Bedford Street – now Sackville Street. It was about 500 yards from the recently-opened Methodist New Connexion chapel. It was enlarged in 1884 and 1887, but as Basford continued to grow, the mission church increasingly came to be seen as inadequate for the needs of the district. St Mark’s was a mission church attached to Holy Trinity in Hartshill, and its supervision came under Holy Trinity, with Basford being classed as an ecclesiastical district. The construction of St Mark’s was an attempt to reach out to a growing urban area and to supply its spiritual needs. How was St Mark’s active in the community at this early stage of its life? Well, we know that there was a St Mark’s Cricket Club, which held its annual entertainment in the schoolroom at Bedford Street. Efforts to raise money for the building funds of the church continued after its opening. It was noted that the 1878 church had cost £1,300 and that since then, £400 had been subscribed. It evidently took St Mark’s some time to pay off the building debt. At the church’s 2nd Annual Festival in 1880, the debt was still just over £405, and the Bishop of Lichfield urged parishioners to continue their contributions. In 1899, the vicar of Basford, the Rev. H. E. Butler concluded a vestry meeting by broaching the idea of a new parish for Basford. He added that he had held discussions with the Challinor family, who owned the Basford Hall estate, and that they had promised concessions on the price of land on the estate, in the event of a church being built. This was encouraging for the vestry committee. A subscription list for the purchase of land was set afoot in 1901. Land for a new church was purchased in Basford Park from Charles Edward Challinor of Basford Hall. Challinor sold the land – on the Basford Hall estate – on generous terms and later returned £200 towards the project. When the Rev. J. F. Haydon became the Vicar of Basford in 1908, plans for the new church were given fresh impetus, and by 1912, the building fund had raised over £3,000. The foundation-stone laying on 25/4/1914 (St Mark’s Day) was preceded by a walk from Bedford Street, along Oxford Road to the site of the new church by clergy and choristers and the foundation-stone was laid by the Earl of Dartmouth. Coins of the realm, contemporary newspapers and a copy of the parish magazine were inserted into a cavity inside the stone. The ceremony was conducted with full Masonic rites and there was a vast attendance of clergy, Freemasons and parishioners. It was reported at this time that future enlargement was envisaged, and indeed, there are surviving illustrations of the church tower that was planned. Sadly, these plans were scaled down. Nevertheless, the church could accommodate 500 worshippers. On Friday the 1st May 1914, cinematograph films of the foundation-stone laying ceremony were shown at the Marshlands cinema, in Church Lane, Wolstanton. Efforts to raise funds for the church project continued. At this period, St Mark’s was holding annual gymkhanas at the Kingsfield Oval in Basford. At the 1914 event, the community could enjoy a baby contest, donkey rides for the children and dancing to an artillery band. There were also a number of sports, including handicap races, and some rather bizarre-sounding contests. These included a ladies’ potato-gathering race and a cigarette-lighting race! Several months after the laying of the foundation-stone, war broke out. Funds and manpower both began to wane, but even that couldn’t stop the erection of St Mark’s – albeit it on a modified plan, involving temporary structures. The church of St. Mark’s was designed by Austin and Paley of Lancaster and built by Stephen Heath of Basford. Heath had also built the Steel Smelters’ model cottages (1904-5), which still survive today, overlooking Moreton Parade in May Bank. His daughter was appointed organist and choirmaster at St Mark’s in 1916. The church was consecrated on St Mark’s Day, 1915. That year, Basford parish was created out of Hartshill and Wolstanton, a reflection of Basford’s growth as a residential area. The Rev. John Frederick Haydon was the first vicar of Basford. He held the living for 25 years. His wife fell ill in late 1933, and required the warmer weather of the south of England for health reasons. Leaving the parish in February, 1934, Haydon retired to live in Bournemouth and died in 1937. He was, however, buried locally, in Hartshill Cemetery. Over the years, St. Mark’s continued to grow. Vestries were consecrated in 1928, and there is a foundation stone still visible on the Broughton Road flank of the building. In 1949, the new war memorial organ was dedicated in honour of the 41 men and women of the parish who gave their lives in World War II. The west end of the church was designed by Charles Lewis, commenced on St Mark’s Day, 1970 and completed 22/7/1971. In 1995, a parishioner of this church, Jack Bragg, wrote a history of Basford and St. Mark’s. The new vicarage, to the right of the church, was blessed in July, 1987 and its present incumbent is Father Terry Bloor.